Learn about the Brady BMP®51 Label Printer Facility Identification Starter Kit with pricing, features, and FAQS. The BMP 51 Label Maker is a label printer with a large display screen, built-in labeling apps, and other features that allow you to create labels without being connected to a computer. Quick & easy label design. Rugged industrial printer and materials. 6" x 10.3" x 3.6"
You can carry the BMP 51 Label Printer throughout your facility to quickly and easily make labels on the go. Prints on a variety of continuous and die-cut materials up to 1.5 in. wide that come in hassle-free, top-loading media cartridges. Features a 300 dpi print head, a built-in cutter, and a print speed of 1 inch/second. Offers three power options: AC Power (included), rechargeable Lithium Ion Battery (included), or 8 AA's (not included). Discounted price already reflected. Discount based on buying kit items individually. Pair with the Brady Text Labels mobile app for compatibility with the Fluke Networks Linkware Live Solution. NOTICE: This part cannot ship via air or to Alaska/Hawaii. The AC adapter allows you to power your printer without the need for recharging or replacing used batteries. Power supply formatted for North America. Use AC adapter/charger unit (included) to charge battery. Pros: WiFi & Bluetooth enabled, easy cartridge changes, built-in cutter, QWERTY keypad, mobile app. Cons: Only prints 500 labels at a time. Bottomline: Great label printer with built-in label apps for designing labels fast and easily. 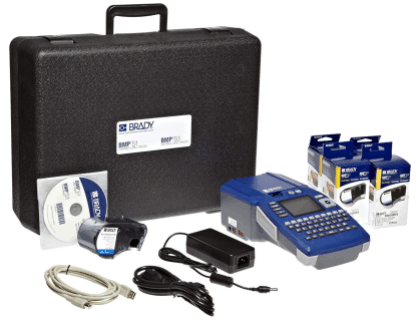 The Brady BMP 51 Label Printer Starter Kit retails for $669.99. 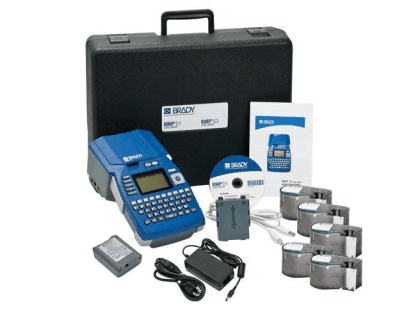 Brady Kit with BMP 51 Label Printer and Li-Ion Battery. A variety of durable indoor/outdoor vinyl tapes. 1.5" Yellow label roll with black ribbon (MC-1500-595-YL-BK). 1.5" White label roll with red ribbon (MC-1500-595-WT-RD). 1.5" Green label roll with white ribbon (MC-1500-595-GN-WT). 1.5" White label roll with black ribbon (MC-1500-595-WT-BK). 2" x 1" labels for low surface energy labeling (M-20-483 Label Cartridge). What type of materials can the Brady BMP 51 Label Printer print on? The Brady BMP 51 Label Printer prints on continuous tapes and die-cut materials. Where can I buy the Brady BMP 51 Label Printer Facility Identification Starter Kit? You can buy the Brady BMP 51 Label Printer by clicking on the link above, or from sites like Megadepot and Amazon. What are some Brady BMP 51 Label Printer Facility Identification Starter Kit alternatives? We use the Brady BMP51 for wire labels. A bit more expensive and less portable. I like the idea of a smaller label maker for when I'm running around doing panel terminations. I've got this label printer, a Brady BMP51, that really lacks support for anything outside of windows. It's unfortunate because it does a good job but I don't want to dedicate a windows machine to it... so I'd like to write my own driver for basic printing needs. I've used kroy 5100, Brady bmp21, Brady bmp51, brother pc-9700c, and rhino 6000. The best was the bmp51.